New Balance's marketing pitch: The science of soft. 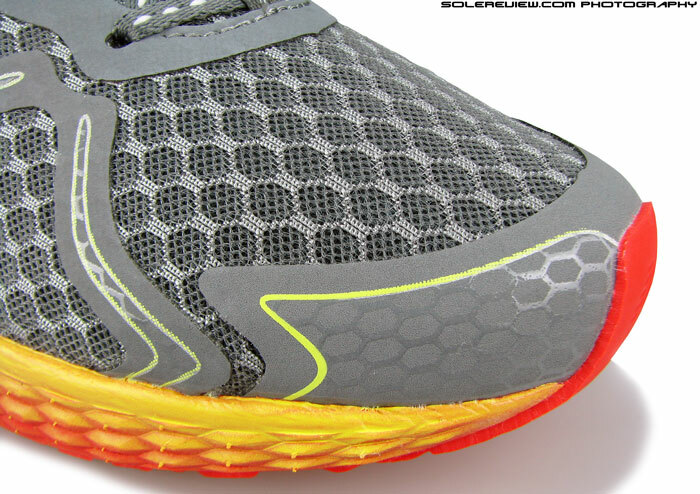 Upper: Spacer mesh, synthetic leather and welded overlays. Midsole: EVA foam, 4mm heel drop. Weight: 289 gms/ 10.2 Oz for a half pair of US 11/ UK10.5/EUR 45/29 CM (NB sizing). Widths available: Standard 'D' (reviewed), 2E(wide), 4E(extra wide) in select colors. 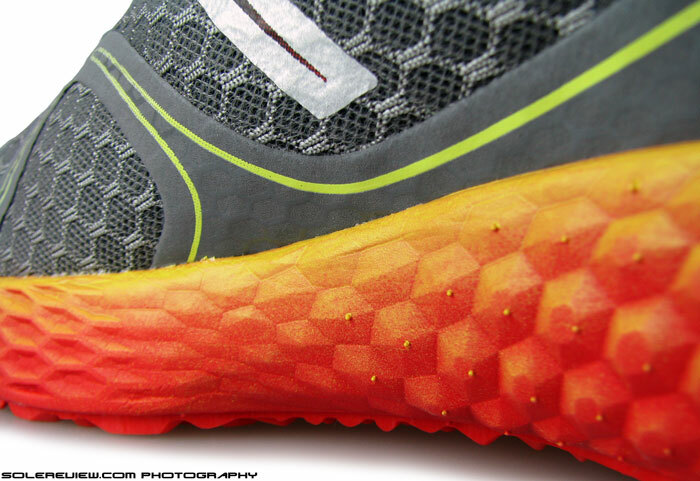 The marketing description of Fresh Foam 980 is at severe odds with its real world performance. This is a good shoe, but calling it 'Science of soft' is just setting the stage up for disappointment. This lightweight shoe has a firm ride and pleasing fit quality, and that's that. Lack of reflectivity, underwhelming level of cushioning, scratchy tongue under barefoot use. The Fresh Foam 980 is New Balance’s push into the maximal trend. Or so it seemed. We first chanced upon the Fresh Foam 980 at a running shoe store earlier this year, a couple of months into its launch. ‘Science of soft’, the promo tent card said. And with a striking midsole design which visually looked that delicious, we did what anyone would do; pick the shoe up and squeeze the foam using our fingers. And what we felt was the opposite of what anyone would expect – the foam was hard. But past experience has often told us that the finger squeeze test can be a poor prophet of how the shoe actually feels during a run. A midsole which feels soft to squeeze can end up feeling flat during usage (GoRun Ride 3), and a shoe which comes across as rock hard can actually deliver a surprising level of cushioning, like the Brooks Adrenaline GTS 14. 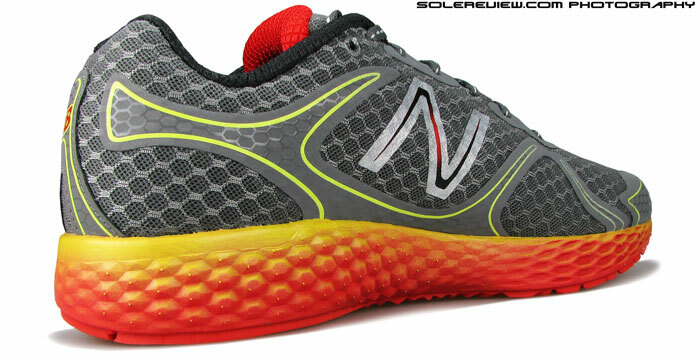 So the New Balance Fresh Foam 980 naturally got the benefit of doubt, and we made a mental note of adding it to our review list. The shoe is in its final months of product lifecycle, with its successor the Fresh Foam Boracay being primed for a SP’15 launch. But we needed something interesting to kick-off our New Balance reviews with, and the heavily hyped Fresh Foam 980 seemed a good place to start. We’ll get to NB’s finest (1080, 890 etc) in due course of time. 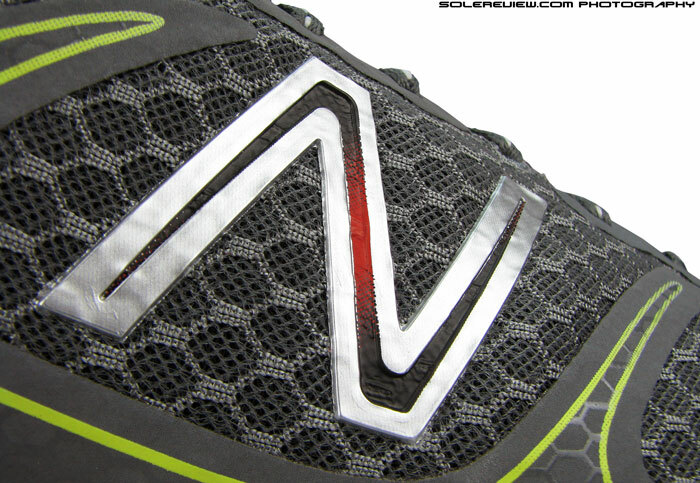 The 1260 V4 is next in line to be reviewed, in case you’re interested in NB’s upper rung, made-in-USA stability model. When you look at the New Balance running shoe line, 980 is the odd one out. In the sense that the shoe is positioned as a new ‘maximal’ cushioning offering from NB, while rest of the products are traditional support and neutral products. Okay, maybe some lingering remnants from the 2009-2011 trend too, represented by far and between Minimus models. No guesses how the 980 came into being; fluffy Hokas appear to be the obvious source of inspiration. But compare the NB with the cheapest road Hoka (Clifton), and disappointments are bound to happen. 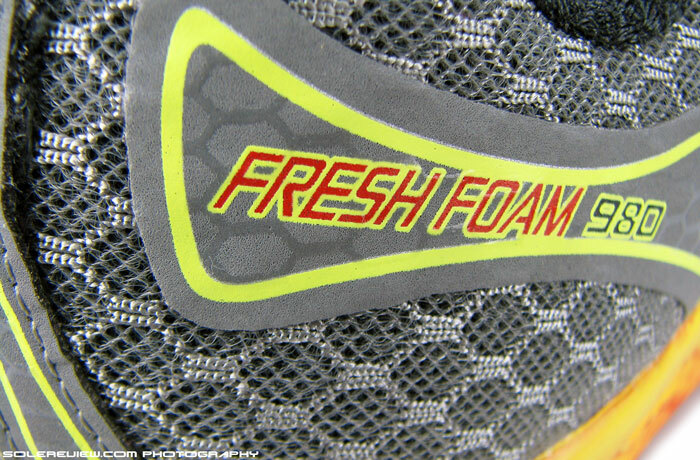 For the Fresh Foam is nowhere as soft as what the brand makes it out to be. The shoe is comfortable, adequately cushioned, well fitting, lightweight and all that, but it is no soft foam marvel. If there’s a Hoka worth doing a 980 shoot-out with, it’s going to be the 2 mm drop Hoka Huaka, which by the way, is as ‘un-Hoka’ as they come. The straight walled midsole might look huge, but it actually isn’t. The Fresh Foam 980 features a 4 mm heel drop, single piece midsole which lies somewhere between the Hoka Huaka and Saucony Kinvara 5 in stack heights. This is saying that the midsole thickness is average, no more than a traditional neutral. The flat un-layered midsole profile, combined with exaggerated sidewalls which go higher than insole levels, give the 980 silhouette a maximal aesthetic. …while medial side has the same shapes projecting outwards. These do have functional significance. Midsole detailing is quite a sight to behold. 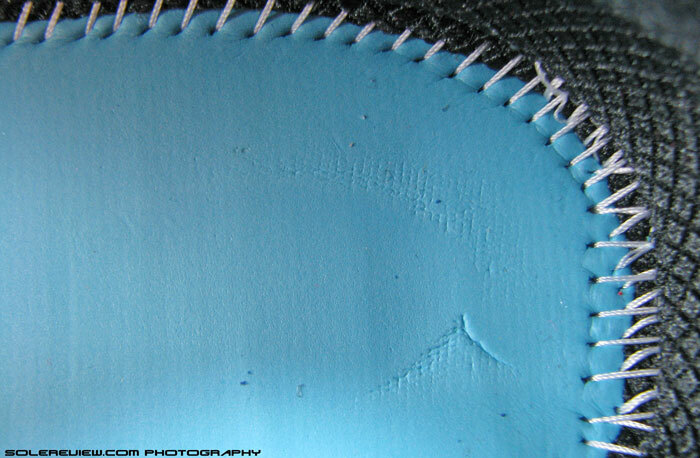 Hexagonal recessions feature on lateral side of the compression molded EVA midsole, while similarly shaped projections extend from the medial side. This isn’t merely cosmetic, and play a small functional part – a topic which we’ll expand on later. It is very likely that your first impression of wearing the Fresh Foam will vary depending on whether you’re walking, doing slow runs or tempo running in them. A heel or forefoot strike will also influence your opinion. That’s because the Fresh Foam 980 uses three components to produce its level of cushioning, and they come into their own depending on how you choose to use the shoe. The first two are the midsole unit and drop-in footbed, with third being the outsole. The real star of the show is the plush Ortholite insole. Squishy layer of air blown foam. 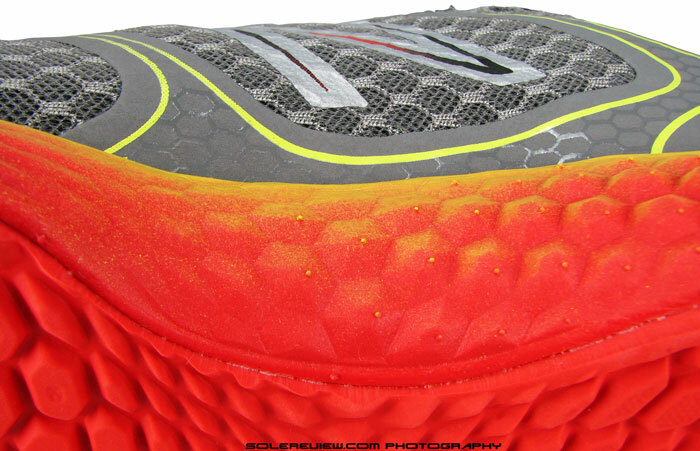 Here’s looking at the only source of responsive cushioning up close. 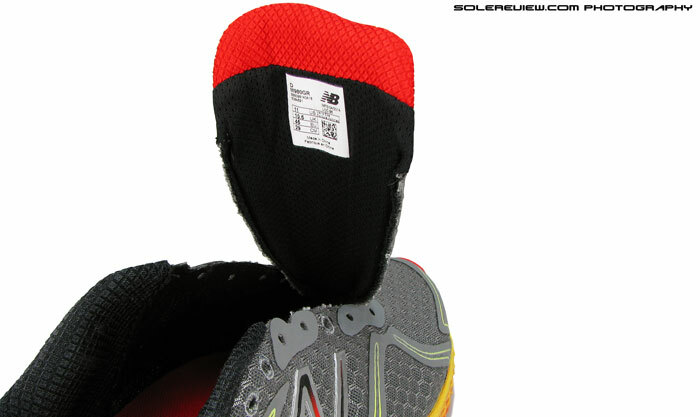 This is the EVA foam strobel between the insole and midsole. The sockliner is a plush, molded sheet of Ortholite foam which runs around 5-6mm thick. Very comfortable, its spongy nature noticeable when you slip into the 980 for the first time. This is the part which gives the 980’s ride a hint of softness and responsiveness, and is felt more during walks or slow runs. Pick up pace, and you start reaching into the midsole and outsole’s properties, which when combined, results in firm cushioning. 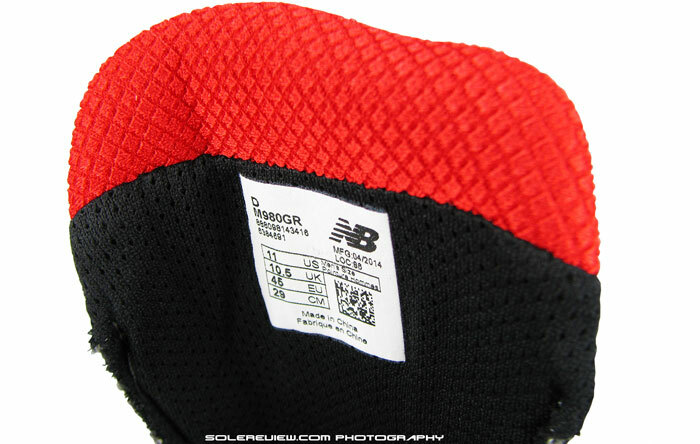 The midsole is firm, and echoes the results of the finger-squeeze test. It felt firm to compress, and that translates into a firm ride too. The true nature of Fresh Foam 980’s ride is revealed once you swap the Ortholite with a lower grade insole from Hoka Clifton. Only way to isolate the midsole’s cushioning character is to take out the Ortholite footbed and replace that with a flat, foam starved insole. Fortunately, the Hoka Clifton came with one such footbed, and played a handy part in this test. So out came NB’s squishy insole, and in went Clifton’s ectomorphic sockliner. The transformation was instant. For all the drum beating about Fresh Foam being soft, the shoe actually rides quite firm. Bereft of a critical component, the 980 midsole’s true nature became very apparent. The word to aptly describe the ride would be firm. The foam isn’t rock hard; the minimal compression felt is what you’d expect of a regular EVA midsole. There’s hardly any responsiveness or sink, which makes the shoe’s 4 mm drop effective as advertised. 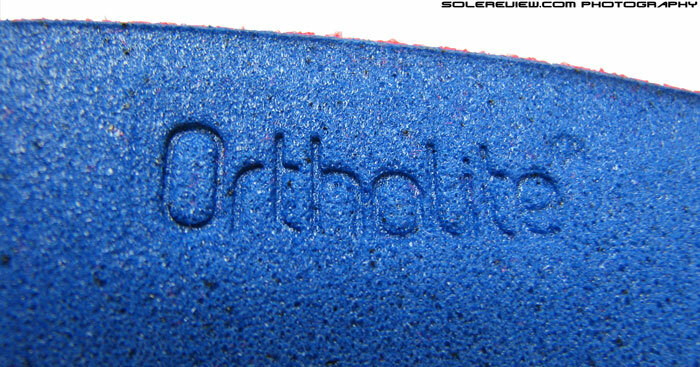 Once we put the original Otholite back in, it revived the missing element of underfoot padding. This shoe ain’t no softy. But like we said earlier, if you are looking for exceptional softness, the Fresh 980 will do nothing to make you happy. Speaking our mind, the marketing of this shoe is misleading; this shoe is not soft at all. New Balance sets lofty expectations by saying things like the shoe ‘will take neutral cushioning to the next level’, but falls short on walking the talk. The shoe is no Clifton, assuming that type of shoe was supposedly in 980’s crosshairs. 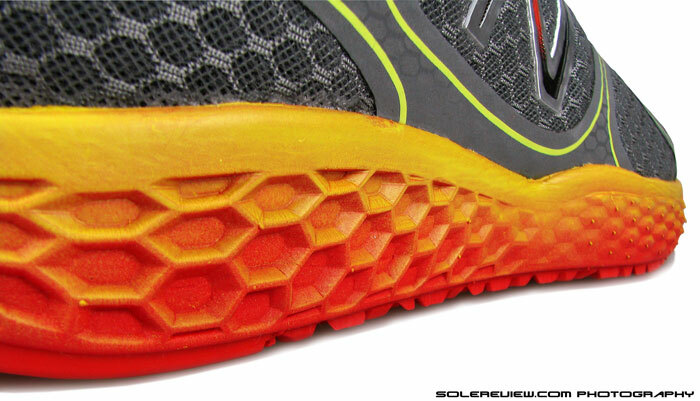 The full ground contact outsole might appear to be a singular piece, but wait. There’s a separate crash pad in the rear, separated by an arc shaped groove. The third piece to Fresh Foam equation is the outsole, which happens to be this full contact area made of soft blown rubber. It looks like a single sheet of rubber, but it isn’t. 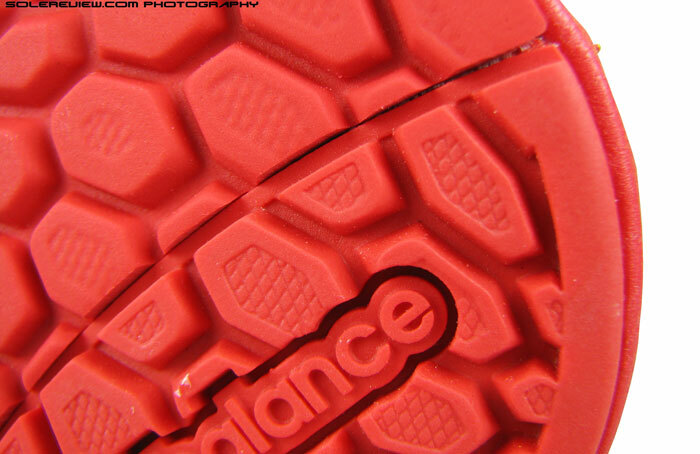 The rear-foot strike area is actually a second piece of rubber, the joining line barely noticeable. But land heel first on these, and that section comes alive as an independent crash pad, momentarily flexing away from the main outsole. This enhances the cushioning feel, and that’s why we pointed out that the shoe will respond differently based on whether you forefoot or heel strike. The cavities on the outer side influences cushioning behavior. There’s bit of a lateral bias to rearfoot cushioning. 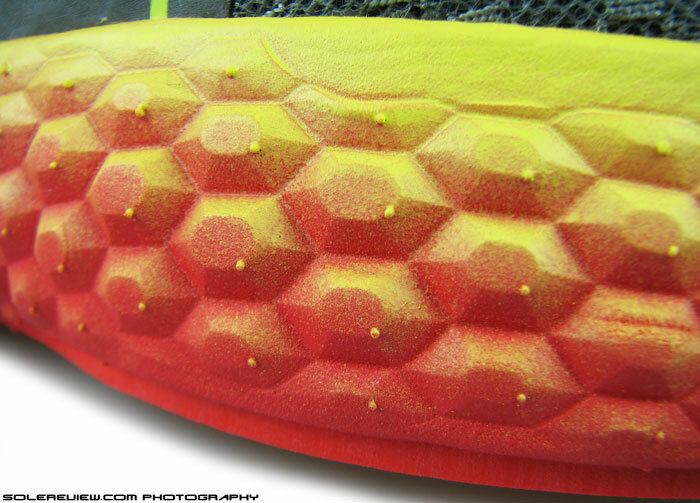 Going back to what we highlighted earlier, midsole wall design does make a functional difference. 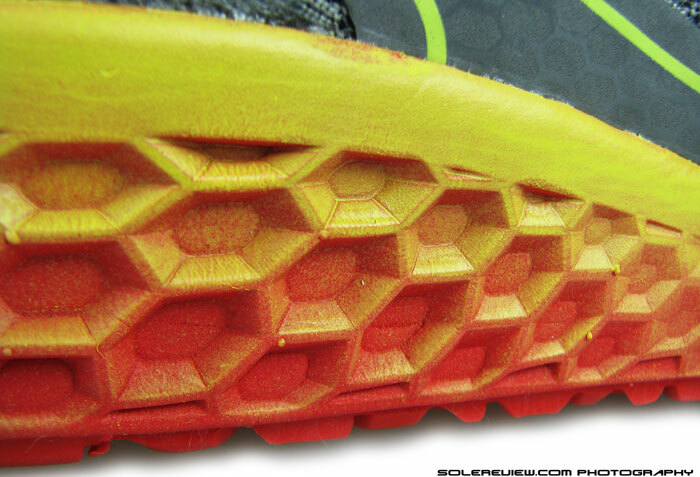 As the lateral (outer) side have these hexagons recessed in, compression happens at a greater level compared to the medial face, where the midsole foam hexagons extends outwards. The forefoot design is opposite of that, which means forefoot strikers will experience cushioning with a marginal medial bias. That said, the Fresh Foam exhibits a behavior which is undeniably neutral, which is precisely what it’s meant to do. Outsole grips really well. Multiple lugs spread over the entire expanse of outsole does a stellar job at traction. Durability is so-so, as expected of blown rubber, with quick wearing out of foot-strike area (heel in our case) seen after half a dozen runs. Close-up of the heel crash pad. This part flexes independently during landings. 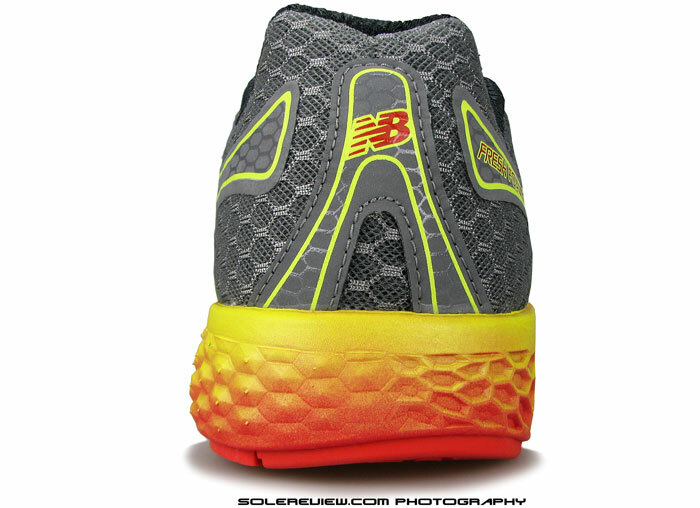 Heel is stable due to firm midsole foam and raised sidewalls. The angled bevel of crash pad smoothens transition. Transition is a plus here; firmness of the midsole might not deliver the ride you were expecting, but instead serves to provide a well spread, overall consistency of ride. Heel strikes start gradually with the beveled crash pad, which has a higher range of flex relative to rest of the outsole. The flat profile of outsole also aids smooth weight transfer, its entourage of small lugs thinning out pressure over a larger area. Stability also benefits from a midsole foam which doesn’t buck you around at all. The foundation’s pretty solid in the heel, and forefoot too. 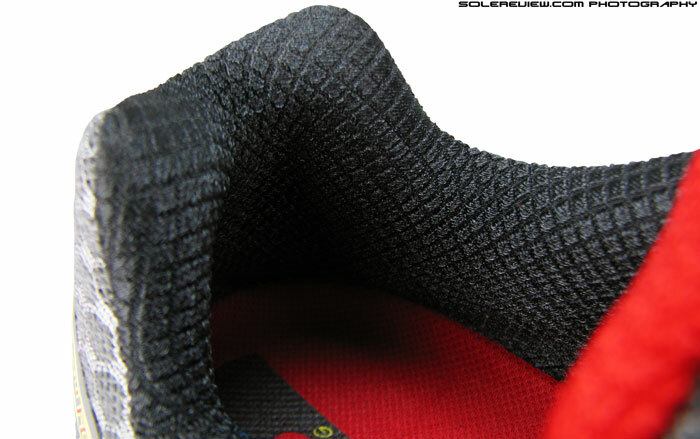 Raised midsole walls also keeps the foot from experiencing a potential sideways slide. Lack of outsole articulation, however cramps forefoot flexibility. There isn’t much of a toe spring either, resulting in a low level of forward roll – letting the foot do most of the work. Do take note that the low heel drop (4mm) tends to work your lower leg a bit, so some Achilles soreness can be expected if switching from a higher heel drop shoe. Overlays are stitch-free synthetic leather panels. They’re printed on top with lines and transparent hexagons. Upper mesh also sticks to the hexagonal design theme. Two layered, breathable spacer mesh. The reverse side of mesh forms the lining. Interiors are seam-free, except for the tongue edges getting in the way. This sole unit is mated to a minimal looking upper, which happens to be nothing more than a combination of a large mesh component, stitch-less overlays and a single point attached (no gusset) tongue. 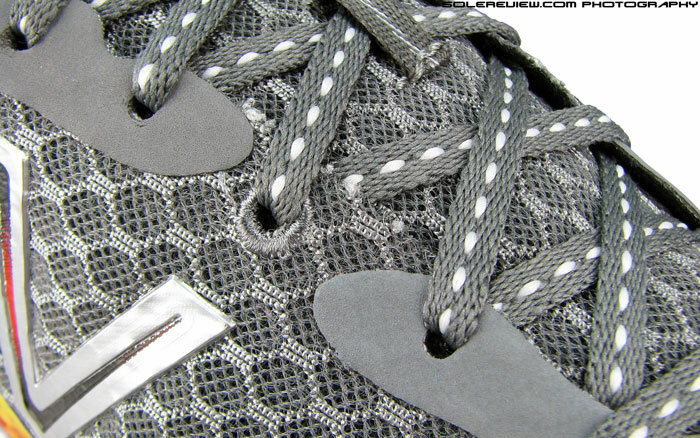 The upper mesh surround the lacing area is a one piece cut, only joined at the heel. Fairly breathable too, and helps remove any internal seams – though the tongue inner edges end up being somewhat of an issue. Medial side toe bumper curves over the big toe. Giant ‘N’ logos stuck on midfoot sides, and offer structural support and eye candy. Not reflective, though. Synthetic nubuck pieces are located in places where the upper needs structural support. The toe bumper has an asymmetric design, with a section curving over the big toe. There’s a pair over both forefoot sides, while rest of the panels snake their way around midfoot and sides of the heel. Subtle, hexagonal resin printing with bold lines are visible once you turn the shoe around in light, and go well with the midsole design. 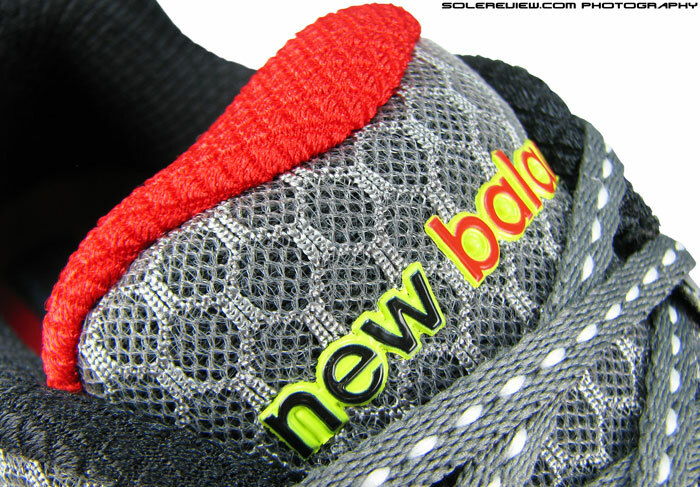 New Balance ’N’ logos adorn the sides and help slim up the profile; we hoped these were reflective, but no luck. Plush collar material with plenty of padding to go around. Laces are great. Spreads pressure evenly, and stay tied. If there’s any iota of plushness, that’s concentrated in the back. The collar makes use of a premium hand-feel fabric which drapes over foam stuffing. 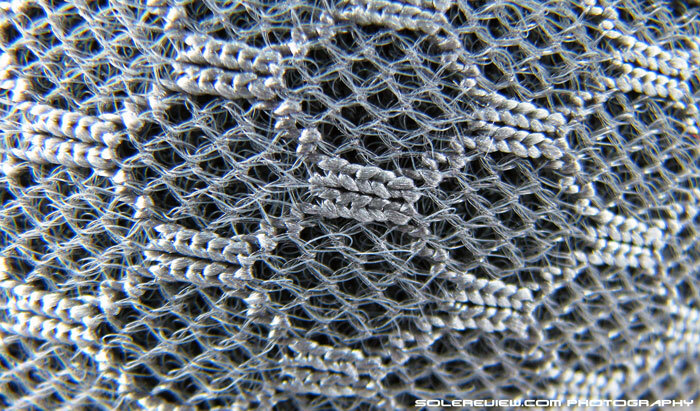 The same mesh forms the extremity of padded tongue; rest of the latter is two layered fabric with foam in between. Lacing is thin and flat, which matches the minimalist overtone of the upper. Functionally superior too, they pass through the eyelets effortlessly and cinch well. The Fresh Foam 980 has a good quality of fit. Forefoot is snug in default D width, but at the same time there’s uniform pressure sans any bite. 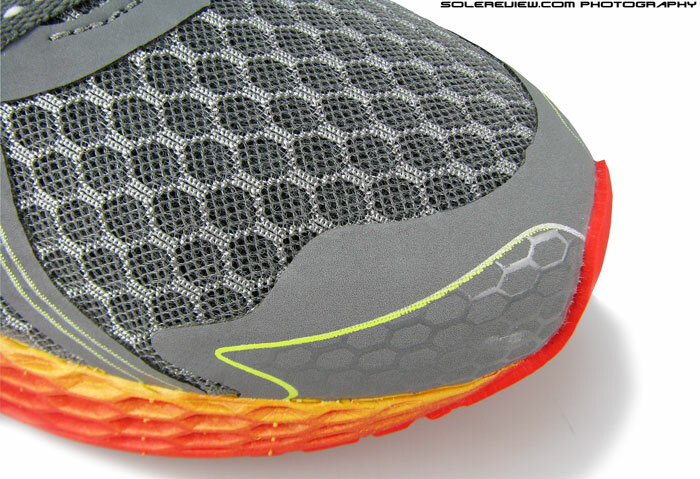 The material at widest points of forefoot is mesh so the area molds well around foot shape. However, if you’re looking for some splay room, then it’s worth moving up to a wider (2E or 4E) upper. Toe box height is perfect, neither too shallow nor too baggy. Sizing runs near true, with a little more space ahead of toes than many of the shoes we’ve tested. Try them on and be the best judge of what fits you best. Tongue is attached only at the front, making it prone to lateral slide. Midfoot stability is decent, but under arch support is not part of the feature set. As on cue, midfoot also runs snug except for a loose spot under the arch. The midsole also lacks functional geometry to bolster that space; this will be not an issue for many, but in case you’re looking for arch support, the NB 980 isn’t the one to deliver the goods. Discounting that, midfoot fit feels secure, helped by the consistent tension from flat lacing. Tongue being a non-gusseted type, tends to slide laterally during runs. There’s also more tongue than what’s needed; top part of it rides up the foot, though it does so without causing discomfort. 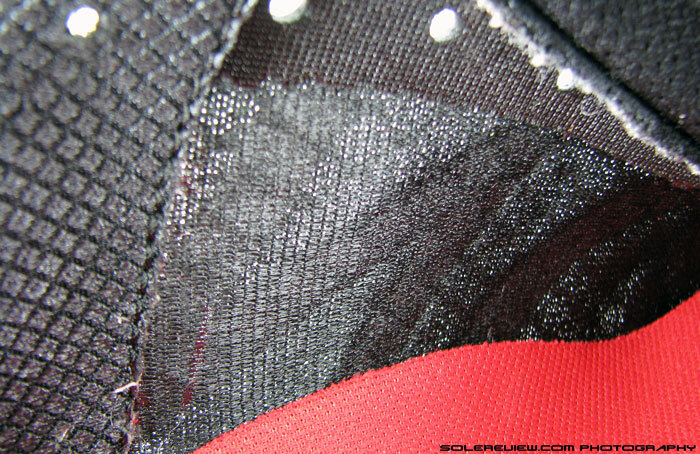 Collar wrap is effective, and this part of the shoe can be made snugger by using the last eyelet row. That also reins in the flappy tongue end. If there’s anything amiss in the fit, it’s the tongue edges near the front part of lacing causing irritation under sock-less use. The upper part of tongue mesh (same as used on rest of the upper) is rough, and chafes uncomfortably against the skin. Good shoe it may be, but the disconnect between the much tom-tommed ‘Science of Soft’ and actual firm ride will leave many scratching their heads. The New Balance Fresh Foam 980 comes attached with connotations of extreme softness, but the reality is a sharp disconnect. If you choose to ignore that obvious discord, it’s a good shoe, no doubt. But most will unanimously agree that it has a blunt sense of purpose – what is this shoe meant for? It is certainly no cushioned roader; nor is it a tool for fast paced training. Calling it ‘science of soft’ is certainly is a stretch, when bench-marked against higher standards out in the open. Perhaps the upcoming Fresh Foam Boracay will have an answer for this conundrum. Or maybe not. Great reviews. All of them. Appreciate the work you’re putting in. There are a couple of lightweight neutral trainers that I’d be interested in reading about that I don’t see on your calendar: New Balance m890v4 and Asics Gel Excel33 . Any plans to get to these? Regardless, keep up the good work! Thanks for the comment and for the suggestions! Both the models you mentioned are reaching their end of lifecycle and due for SP’15 replacements. We’ll definitely cover the 890 and 1080 V5 when they release, and will also try for the Excel. Excellent review that exactly mirrors my thoughts. I did not run in the shoe, only a jog in the store isle, but could easily tell the lack of cushioning. The deal-breaker for me was the lack of flexibility. I hoped it was a NIke Free with a touch more cushion/support. Thanks – their foam formula needs a lot of improvement if they need to deliver on the ‘Science of Soft’ promise. Hoping that future iterations will be an improvement. The Boracay is REALLY fun to run in. I ran in the 980 and thought they were just “meh”. I’m really liking the Boracay; it feels like that the original should have been! Exactly; the Boracay is what the original 980 should have been from the very start.